The torque tester PCE-CMT is used in the industrial sector for quality control. The torque tester PCE-CMT is exceptional thanks to its strong measurement cell, its high resolution as well as its overload protection. The torque tester PCE-CMT works in a bidirectional way so the torque tester PCE-CMT is able to detect force in both directions. Values are displayed in different measurement units (Nm, kgfcm or lbfin). 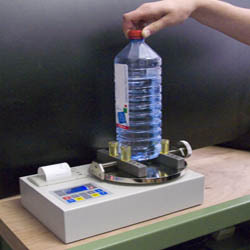 The built-in printer allows printing of the measurement values of the tester. The torque tester PCE-CTM can detect up to 10 measurement values and transfer them to a PC or portable computer. 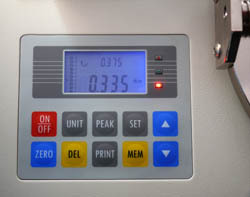 It can also record peak values (for example to open and close a vessel). During the measurement, it is possible to select the display of the current value or the peak value independently of the rotatory direction. 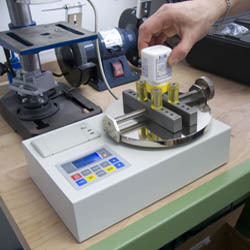 The torque tester PCE-CMT works with an accuracy of ±0,5% along the whole measurement range. 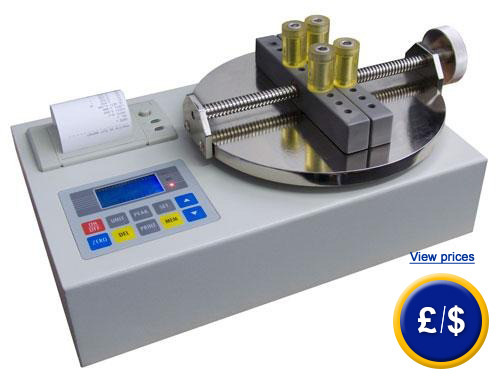 This instrument is able to be used in laboratories and also for easy measurements in the industrial sector. The strong measurement cell is overload protected 150 %. Here you will find an overview of all the torque meters available at PCE Instruments. 0 ...+ 40 ºC , below 80 % H.r. 0 ...+ 50 ºC , below 80 % H.r. 1 x torque tester PCE-CTM, 1 x printer (integrated), 4 x pins ( 33 mm length ), 1 x PC RS-232 cable, 4 x feet, 1 x allen key, 1 x software (CD), 1 x roll of paper for the printer, 1 x aluminium carrying case and user’s manual. For companies that wish to incorporate the torque tester into their internal quality control system of tools or for annual calibrations. The certification meets ISO standards and includes a laboratory calibration and a certificate which contains the measurement values.